I had been aiming to read at least six of my own books so I’m very happy with eight although I didn’t manage to read Murder in Piccadilly by Charles Kingston as I had planned, that one will be carried forward to be read in April. I’m hoping to read at least six of my own books in April, I’ll definitely be reading Oblamov by Goncharov because I got that one in the Classics Club Spin. I have a horrible feeling that I actually bought more than eight books in March though, so the TBR pile is still increasing! The Edge of the Cloud by K.M. 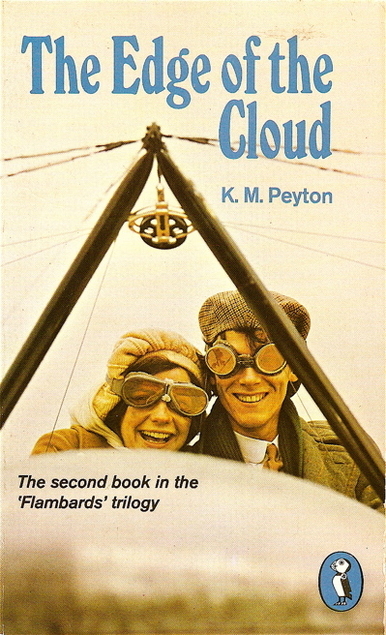 Peyton is the second book in the Flambards series and was first published in 1969. Christina is now eighteen and she has been living with her uncle and her two male cousins who are a bit older than her. Her uncle is determined to marry Christina off to her eldest cousin Mark and so keep Christina’s money in the family. Her uncle and cousins are cash poor but do have a large house and estate where horses and hunting are the only things of importance. Christina is in love with the younger cousin Will, and unlike the rest of the family he is terrified of horses and riding, flying aeroplanes is his obsession. Christina can’t get her hands on her money until she is twenty-one and she and Will can’t get married until then either, as Uncle Russell will never consent to their marriage, so they run off to stay with Aunt Grace where Christina has to help her with the sewing by which she earns her living. Meanwhile Will has managed to get a job as a mechanic at an airfield and is living in a shed, it’s not what he wants, he dreams of becoming an aeroplane designer and flying them. Eventually he does begin to teach other people to fly and earns much needed money by taking part in air displays, looping the loop and such like. Christina is terrified of flying and of course lives in fear of Will being involved in an accident, neither of them can understand the other’s fear of riding/flying. Inevitably accidents occur. This book is set in 1913 when flying was all new and wildly exciting. A note at the beginning of the book states that the first loop the loop was demonstrated in England by Pegoud in September 1913. The first British pilots to loop were B.C. Hucks and G. Hamel later in the year. Forty-eight British pilots were killed in various accidents from the beginning of flying in 1910 up to the outbreak of war in 1914. The Edge of the Cloud won the Carnegie Medal in 1969 and the trilogy won the Guardian award in 1970. It was published by Penguin as a Puffin Book so was meant to be read by older children, but it’s a good read for children of all ages. I loved the Flambards series when it was shown on TV years ago, that was aimed at adults. There isn’t much in the way of horse riding in this book but if you’re keen on early aviation you might find this one interesting.